Within the feather tracts, Herbst corpuscles are closely situated beside the feather follicles. Herbst corpuscles are mechanoreceptors. Not every follicle has a Herbst corpsucle and there is only a maximum of two around each follicle. A Herbst corpuscle is sausage shaped and often bent double once or twice, so one corpuscle can be seen several times on one cross section. 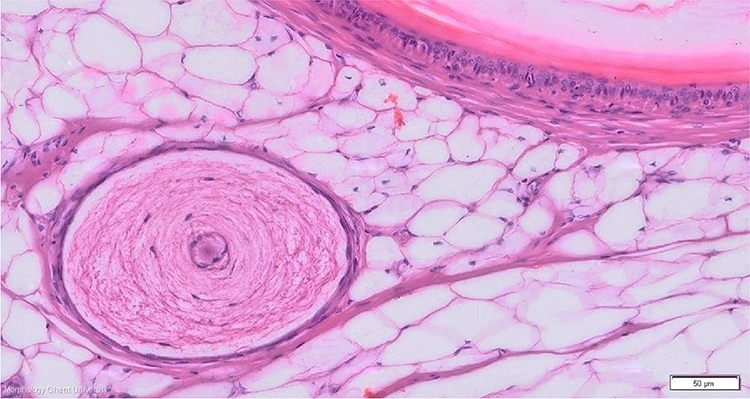 Above can be seen how a Herbst corpuscle is connected to the feather follicle by a strand of connective tissue. This ligament contains many elastic fibers.